I just researched the new Interest List feature Facebook rolled out about a week ago, thanks to some great online resources including Amy Porterfield's quick tutorial, which you can catch here. Facebook's explanation describes the feature as your own customized newsroom. And a recent Huffington Post article calls the new feature a "enough to jeopardize Twitter's long-term growth." While I tend to be skeptical of the usefulness of some of Facebook's new features (Timelines and Milestones are nice, but is anyone really going to read through them when most of us are scrolling quickly? ), I do see the cool aspect of the Interest List, as it allows you in the same way Twitter lists do, to group friends and Pages in a custom category, and see the News feed also as a grouping. I just got started and created a Business List and a Social Media list, ( pictured above), and I can see creating, for example, a local media list for the media outreach I do, as well as a List for books, writing, favorite bloggers, etc. If the laws of reciprocity hold, folks will see that I listed them and will list me, meaning that I will show up in their News feed. Yes, this is cool, and answers to social media "fatigue" by allowing us to customize our Newsfeeds, and therefore subscribe only to those we want to hear from. A good solution to clearing out social media clutter. Note: I read a lot on the Blogosphere that FB through this feature is trying to emulate Twitter, but if you try it out, it actually feels a bit more like the Linked In Groups feature. Try it out and see what you think. You can either Create a List, which will give you preset topic areas, or type in the topic you are searching for under the "Search for Lists" menu at the top. Lists that others have created will appear, and you can subscribe to any you like, which means they will appear in your Newsfeed. If you are creating your own list, after selecting the category, click on Manage Lists to customize what types of notifications you want to receive, and what types of updates you prefer--for example, you can disable Games, Music and Photos, Other Activity, etc. 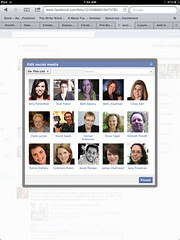 The Share button allows you to share your list in your Timeline and Pages, in a Group, or a friend's Timeline. You can also select whether you want your list to be Public, just shown to Friends, or Private. Using the Edit feature, you can or delete names at any time. Note that you don't need to Like a Page in order for it to show in your Newsfeed, which is a clear departure from how Facebook used to work. So check it out and post your thoughts in the comments. And please feel free to join me over on my Social Media List, it's going to be an adventure. And remember, it's all in the List. Maybe.